Both sides of Frankford between Winding Creek and the west side of Aramis are IN, but stay south of the utility poles on the north side of Frankford. (The boundary crosses over Frankford just east of the water tower to the NW corner of Aramis and Frankford). From this point to Coit BOTH sides of Frankford are OUT. Streets south of Frankford between Winding Creek and Coit are IN. Highland Creek Manor is IN the Eruv. It joins the Eruv near the poles that are westernmost (near Torah Day school) and easternmost (towards Coit) that are in front of the brick wall of the Highland Creek Manor. To be sure, stay on the sidewalk and enter via the front gate. The boundary follows the walls and fences of Highland Creek Manor. If you leave via the rear gate, you will leave the Eruv. You cannot walk anywhere on Coit Road. 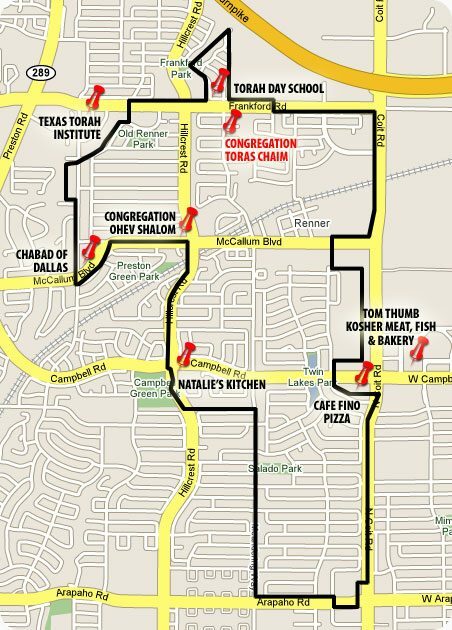 All roads just west of Coit are in the Eruv, EXCEPT the east most section of McCallum in front of the Chatham Court and Gables apartment complexes. The Gables is OUT of the Eruv. Chatham Court itself is IN the Eruv but to stay in the Eruv and to get onto McCallum, you must keep north of the telephone poles until you reach the car wash place. The boundary crosses McCallum to go south between the Gables and McCallum Meadows apartments. All the other apartments on both sides of the road are in the Eruv. The Eruv from McCallum to Campbell follows the fence and wall behind the Target shopping center on the NW quadrant of Campbell and Coit. Lauder Lane and Cleary Circle are IN, but Cafe Fino is NOT. Lauder Lane south of Campbell is IN, but do not go onto Coit. Between Lauder and Arapaho, all roads between Coit and Meandering (EXCLUDING COIT and INCLUDING MEANDERING) are in the Eruv. Also EXCLUDED is the Spanish Village (Borders) shopping center on the NW corner of Arapaho and Coit. For all practical purposes both sides of Arapaho itself are OUT of the Eruv. Along one small section between the east side of Spring Valley and the alleyway next to the Don Pepe Rancho restaurant on the south side, you are IN the Eruv. Between Meandering and Arbor Oaks, the Eruv is on the West side of Meandering. Both sides of Meandering Way are IN the Eruv. The boundary is the telephone line on the NORTH side of the right-of-way area that contains the power lines. You can walk in the alley on the NORTH SIDE. CAMPBELL GREEN is NOT in the Eruv. From the south end of Campbell Green, the boundary is the west side of Hillcrest. Both sides of Hillcrest in this section are IN, but you must stay to the east of the telephone poles. The alley west of the telephone poles on the west side of Hillcrest is OUT. ONLY enter Ohev Shalom from HILLCREST. Both sides of McCallum west of the pole at the corner of McCallum and Hillcrest until Duffield are OUT. The houses on the north side of McCallum are actually IN, and so are their front yards up until the poles. At the NE corner of McCallum and Duffield the boundary crosses McCallum diagonally to the SW corner and picks up the poles in the alleyway backing onto McCallum. The boundary crosses back diagonally from the SE corner of McCallum and Davenport to the NW corner of Davenport and McCallum. Between these two points both sides of McCallum are IN. McCallum Highland apartments are IN. But to get from this point to Ohev Shalom, you must walk via Shellflower and Hillcrest. Between McCallum and Winding Creek both sides of DAVENPORT are IN. Keep south of the wire which crosses Davenport on the north side of Winding Creek. With the exception below, both sides (sidewalks) of WINDING CREEK are in the ERUV (BUT THE HOUSES ON THE NORTH SIDE ARE NOT). EXCEPTION: YOU MUST STAY ON THE SOUTH OR EAST SIDES OF THE TELEPHONE POLES AT ALL TIMES. PLEASE NOTE THAT THERE IS A POLE ON THE SOUTH SIDE IN THE PARK ON WINDING CREEK. So if you are on the North side of Winding Creek one must cross the road and go onto the park and around this pole to get back on to Frankford.